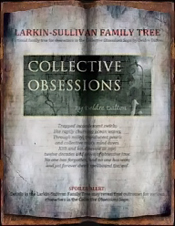 Trace the many connections between the Larkin and Sullivan families as they appear in the Collective Obsessions Saga by Deidre Dalton. Tree details and trivia may reveal the final outcomes for fictional characters. Note: Chart produced using Fam-Tree software. Shannon Larkin and Mike Sullivan are third cousins once removed. 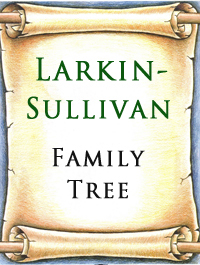 Their common ancestor is John Larkin, who is great-great-grandfather to Shannon and great-great-great-grandfather to Mike (The Twain Shall Meet).